How did everyone like Marly’s interview with her BFF Kristin Omdahl?? Weren’t they fun?? Who else wants to run out and get Kristin’s new book The Finer Edge? Kristin is everywhere on social media these days, and you can find her on Facebook, Twitter, Ravelry, Craftsy, YouTube, and her website! Link to Kristin’s schedule while she is at TNNA this weekend, and where you can find her! As always, we have a fun giveaway, some of Kristin’s Wrapture by Eucalan! You can enter here by commenting below and using the key word(s) that Kristin gave during the show. I sure enjoyed listening to your conversation with Kristin. Her new book, The Finer Edge, looks wonderful. It’s one of the books I would want to have with me if I ever found myself on a deserted island because my crochet edging repertoire is rather limited. I am a stronger knitter so my go-to crochet edgings tend to be very basic. I can see how with some practice and Kristin’s book, I could really beef up my arsenal of edgings. It would be fun to try all the stitch patterns on a deserted island. And no interruptions! The interview with Kristin was interesting and fun to listen to. If I was ever on a deserted island, I’d have to whittle some sticks and find plant fibers to knit with to stay sane. I would love to be on a desert island with all of the time and quiet to knitting and think of designs and patterns. I would finger knit if I did not have my knitting bag and I would find sea weed or any other matter to use. The Finer Edge would be a delightful book to have. This book, my hooks & fiber would be all I would need on a deserted island. OKAY,I’d bring my husband too! Marly I always love the podcast when Kristin is on with you. Listening certainly confers the special friendship. Now if Kristin or you were on a deserted island and a plane flew over I bet written in the sand would be knitting and crochet pattern notes. Both your minds seem to be always working on the next creative projects. Thank goodness we have you both, very productive people in the yarn community. If I was on a deserted island I would love to have all your patterns Kristin. Knitting and crocheting on a deserted island sounds wonderful. I enjoyed the show! I wanted to share I love my children and hubby but would love it at times to be all alone with my yarn on a deserted island! 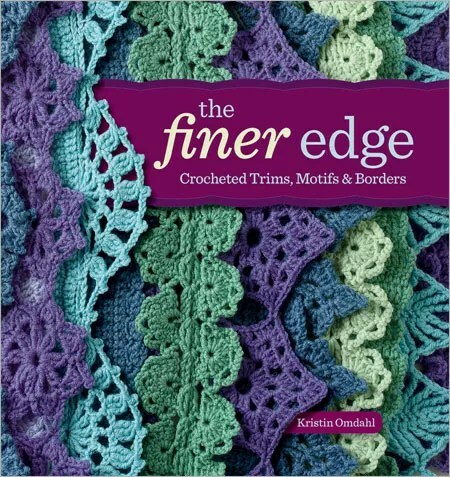 I know if I was on a deserted island I would love to have some Drew Emborsky yarn, Crochet Hooks and Kristin’s new book The Finer Edge! What heaven to be on a deserted island with my most scrumptious yarns, knitting to the music of the waves, against the backdrop of a Caribbean blue sea!